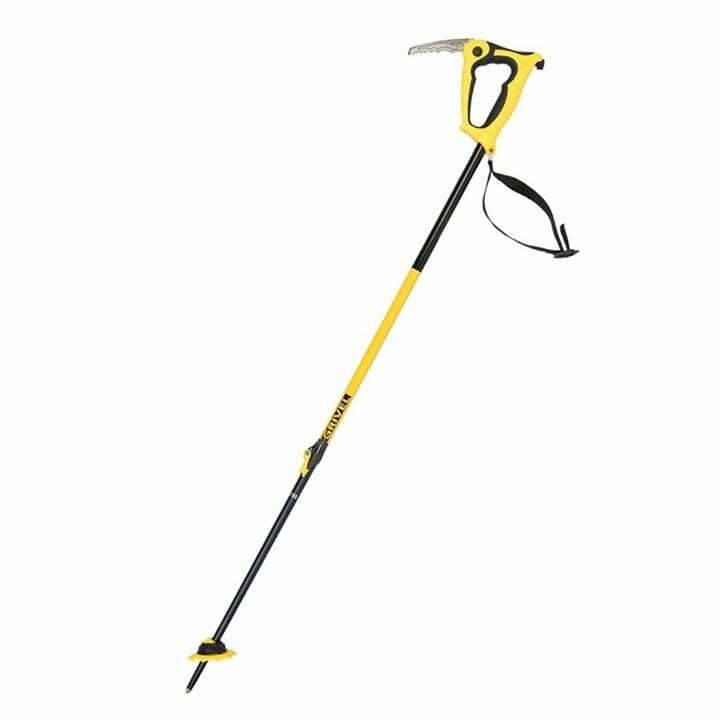 For many people who are new to mountaineering, a versatile walking ice axe will be their first ice axe purchase. Choosing one can be a bit daunting for the uninitiated yet it is actually quite a simple task, especially if you are new to the sport. What is a walking ice axe? A walking ice axe is, in many ways, the original of its breed. Classic walking ice axes were made of strong wood with a metal spike at the bottom and a relatively flat-topped head on the top. In essence it is a step up from a walking or trekking pole for crossing ice and ascending non-technical stretches of steeper snow or ice. In its earliest form, this evolved from a walking stick but provided the ability to self-arrest (stop oneself from sliding down the mountain) by providing a sharp-edged pick (or adze) on the head to dig into the snow. It also provides the ability to dig steps and the like. If you look at old pictures of climbers in the 1930s or 1950s they used quite primitive (if beautiful) ice axes. Over the years, however, the fashion has been for them to get shorter and shorter and to move progressively away from the old-style walking-stick form of axe. The main reasons for this is that a shorter axe is easier to swing and use and is also quicker to get into action when you are trying to self-arrest. Longer ones have just become seen as too unwieldy these days. The first thing to do when choose an ice axe is to be sure that it will meet your needs. If you are planning on doing more serious technical climbing you may want to go for a mountaineering ice axes (sometimes known as Alpine Ice Axes) which will be slightly shorter yet. And if you are doing more serious climbing or plan to belay a rope from your axe you will want to go for a T-rated one (technical rated), which will be stronger than a normal b-rated (basic) ice axe. That said, if all you need is a walking axe for non-technical routes, then you need not spend too much. A simple straight-shafted axe with a b-rating should not cost you more than $60-$70 if you look around a bit. You can naturally pay a lot more for a more expensive and super-light axe or one that will still allow you to progress to steeper terrain and more demanding climbing as you grow into the sport. The most important thing to get right is sizing your axe because it is the length of the axe that will impact most on your ease of use and comfort. If you are shopping in a small store with a limited range, you would do better to get a decent axe that is the right length than to buy the “perfect” axe if it is not sized right for you. Unfortunately the old rules of exactly what the length should be are also very personal and over the years people have been going for shorter axes. The traditional rule of thumb is to have about 2 inches of clearance between the axe and the floor. To measure this stand upright and hold the ice axe by the head (grasp it so that it hangs between your middle finger and ring finger with the palm of your hand coming over the top and your thumb around the other side) and see how much space is left. Remember that big boots can easily add an inch or so to your height. That length is seen as good enough to provide support when climbing up and down and to also provide steadiness if you slip and need to right yourself. Yet it is not too long that you can’t swing the axe easily or quickly deploy it for self-rescue when sliding. That said you may want to go for something a bit shorter if you are planning on tackling steeper routes (if your ice axe is too long you will find it difficult to use on an upward slope). That said you shouldn’t go for one that is too short because then the temptation is to switch to a trekking pole (walking stick) on tricky ground which could lead to trouble in the event of a slip and the need to self-arrest. The camp Neve is a fairly straightforward and lightweight walking axe. It comes in a whole range of lengths all the way from 50cm to 80cm long, so you should be able to find one that fits you, even if you are of the old-school approach that says walking axes should be long enough to stop you from falling in the first place. It has a steel head and a aluminium body to keep down the weight. The Corsa is the more expensive brother of the Neve and is incredibly light weight at just a touch over 200g. This is not an axe you want to put to serious use but if you want to sacrifice durability for lightness then this is the one to go for. This really is a class piece of equipment. It also comes in enough different lengths (all the way up to 90cm) that you really can use it as a walking stick/walking axe with no difficulty. It doesn’t cost too much ($80 or so). It has an aluminium shaft to cut down on weight but it has a really solid cast head (these are way stronger and better than welded heads) with a reasonable angle on the pick. Just for comparison’s purposes, it weighs close to double that of the Camp Corsa, so you can imagine that it is also a lot tougher. The adze is fairly narrow and the head has a big enough hole to take a leash or sling. As a general purpose and strong axe it is hard to beat this. You can also get a version with a rubber grip on the shaft but I don’t like these as they could slow you down if you have to plunge it into the snow really quickly to provide an anchor for a rope. One solution to the problem outlined above of people switching from their ice axe to a trekking pole because their axe is too short to provide support when walking is the new generation of hybrid walking poles/ice axes. These are really not good for much more than glacier crossing and light ascents but they can be useful as a good intermediate between a full-blown ice axe and a trekking pole that will give you no ability to arrest your slide if you fall. This looks the most like a traditional mountaineering ice axe. It has a proper steel head with a pick that will do a great job of digging in to stop a fall. It also has an adze that is broad enough to chop steps with. In its compact configuration is 65cm. This is where the clever bit starts however as it has a telescoping trekking/walking pole built into it so you can expand it right out for walking and crossing shallow icy slopes or glaciers and shorten it for more serious climbing and step-chopping. Some people really hate them but it seems to me to be a sensible compromise between two schools of thought. This is another approach to the same problem. But whereas the Snowscopic tries hard to take a normal ice axe and make it do things that act a bit like an ice axe. 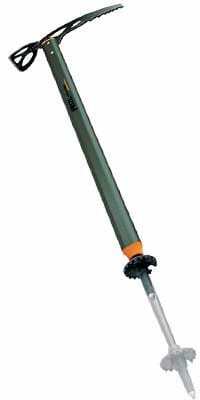 It is basically a grip attachment that plonks onto a trekking pole. When you are crossing tricky ground you can unfold a pick from the grip to be used as an emergency self-arrest device. A lot of people who have tried them say they are happy. I haven’t and frankly am not sure I would trust my life to it. To do self arrest you want to flip over onto your axe and really dig it in and I’m just not sure a telescoping trekking pole is up to the job. That said, it has fewer sharp bits to hurt you with and if you do self-arrest with it there isn’t an adze to worry about digging your shoulder if you aren’t careful.